Travel through history at your own pace. 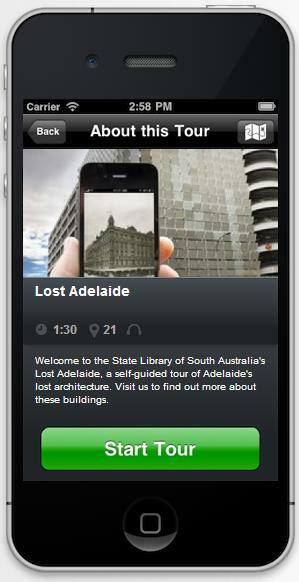 This self-guided walking tour allows you to discover Adelaide's lost buildings using your own smartphone. Located on Adelaide's cultural boulevard, North Terrace, the State Library of South Australia is the largest public reference library in South Australia. This free self-guided walking tour highlights historical aspects of the city, allowing you to travel through time at your own pace. This walking tour features snapshots of lost buildings in Adelaide. Compare historical photos from the Library's rich collections to the architecture of today. For more information on many of the buildings represented, we recommend visiting the State Library to search the catalogue and other resources or visit some of the Library's websites.